Happy Birthday to the Fabulous Kimberly Wiener! One of our very own is having a birthday today!!! I hope you have a fantastic and memorable birthday, Kimberly! 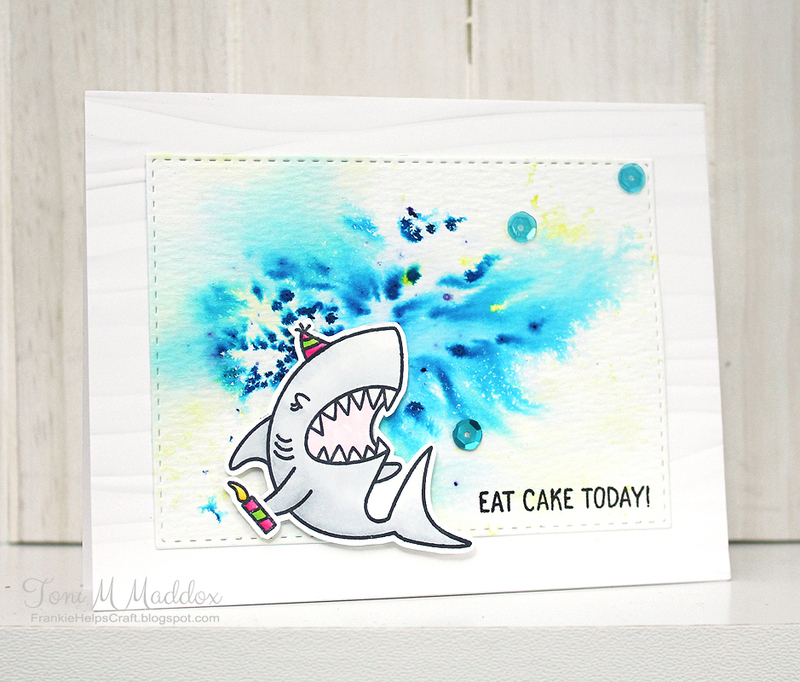 Kimberly makes such fun, bright and fabulous cards, and she has a great sense of humor. She makes me smile! Please do check out the fabulous makes of the other ladies who form our special local birthday buddies group. Lots of fun all around! I made another stab at using colored pencils. I really like the results this round. I had placed Gamsol in an empty Copic marker and that made a world of difference in blending. I like this so much better than a stump. BUT I don't like color pencils nearly as much as my Copics. I'm beginning to appreciate them more tho. And they'll be fantastic for travelling. And how do you like my new die? I love those lacy layers. Frou but not too. 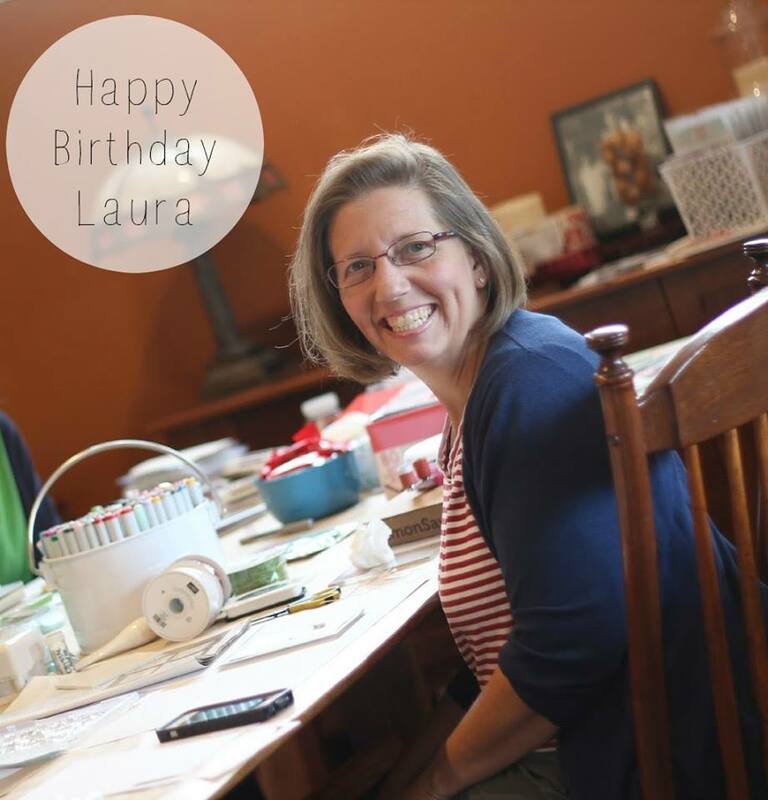 Today we are celebrating our very own Laura Norris' birthday. Laura is so very sweet and kind. I hope you have a wonderful day, Laura! 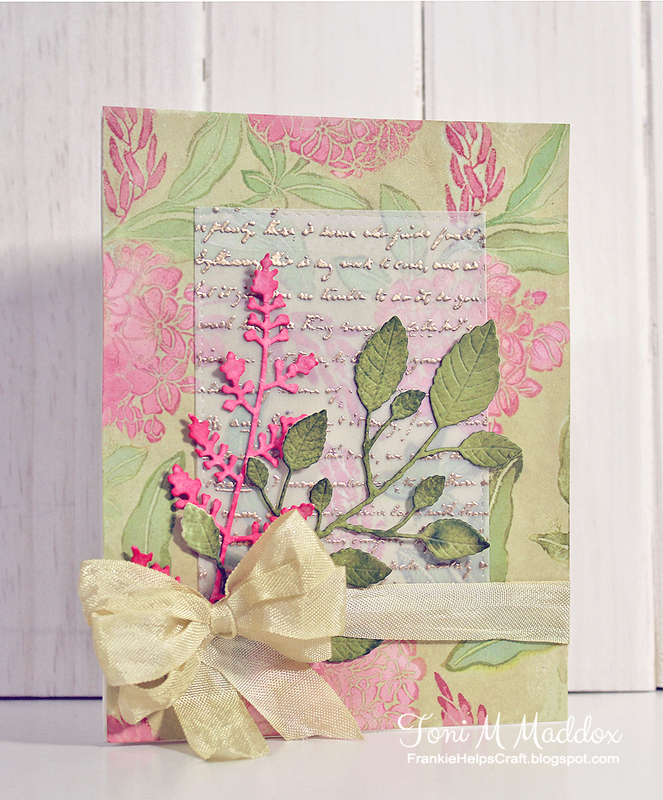 For my card, I used some leftover Lawn Fawn plaid--oh, how I love it! Using the quilt die really mimicked making a quilt. I've made a few quilts and always enjoyed choosing the colors and textures and design far more than the actual assembly. Press'n Seal and Scor-Tape helped immensely in that regard. Now you should have arrived here from Katie's blog and are ready to head to Tonya's blog. Need to catch up? 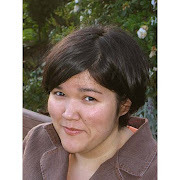 You can find the whole list of participants on Amy's blog. 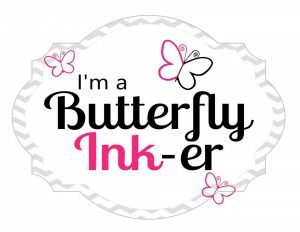 Please also visit Tonya's shop, The Heart Desires, where you can find all sorts of goodies, including the paper and ink used here. 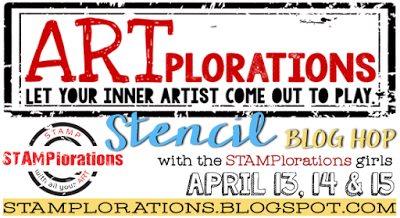 Stamplorations CAS April Challenge Reminder! 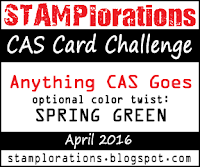 Have you shared with us your Anything Goes CAS projects for April? You still have time and can toss in some Stamploration products or a bit o' the spring green if you like. Love this color! I covered my card with images from the Party Mates set. So cute! I had such fun coloring them up with my Copics and a white pigment pen. 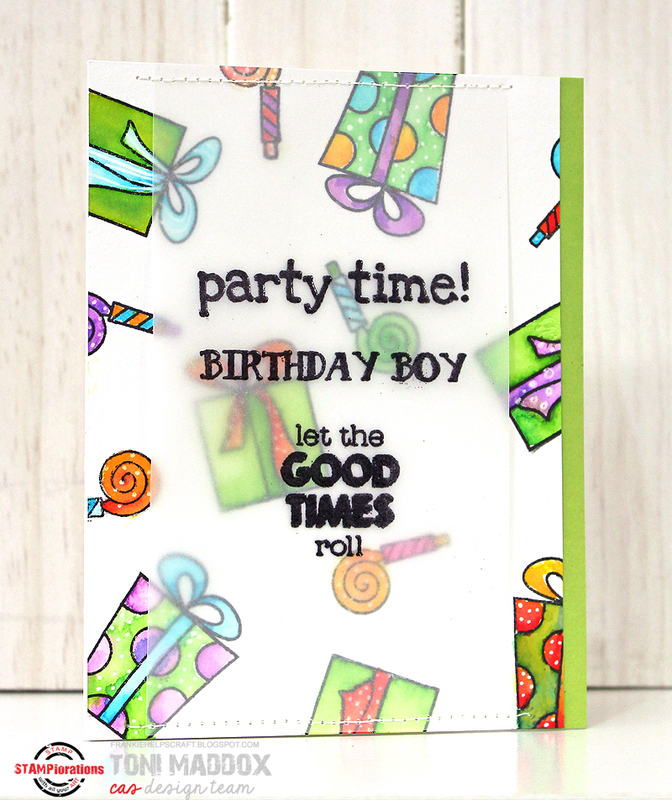 Next I embossed a few of the sentiments from the Party Time set and stitched the vellum panel to the card front. The vellum helps to cut down on the busy-ness of the designs beneath, don't you think? I do hope you'll play along with us. I promise the grass is greener over here! Hello, folks! 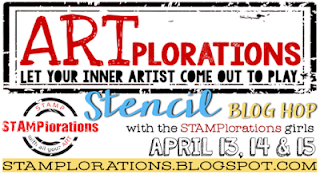 Today marks the start of a fun stencil blog hop at Stamplorations. 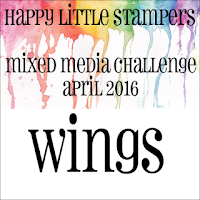 Lots of inspiration to see, prizes to win and free stuff! For my card, I used the Happy Flowers stencil and lots and lots of Bo Bunny glitter paste. 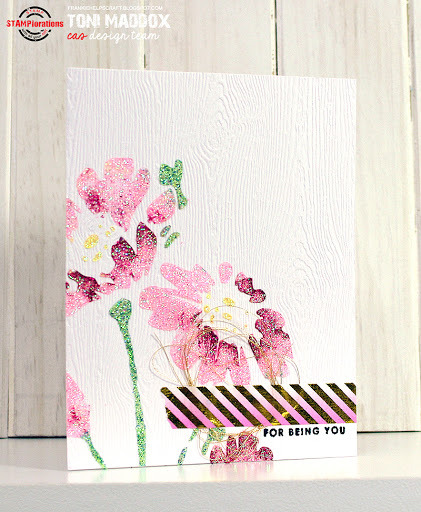 I masked only the outer edge of the card front; I didn't mask, say, the flower center vs the petals. I didn't have to. It turns out once the glitter had filled the stencil opening, I could glide over it with another color without a problem. Good news for messy me! 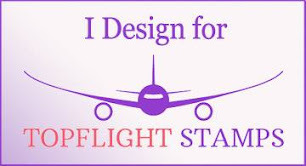 Now don't forget to leave a comment here and on the main blog for a chance to win.  AND, AND, AND, check out what the rest of the team made! 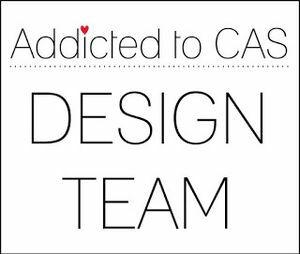 You'll find links to all our projects here. 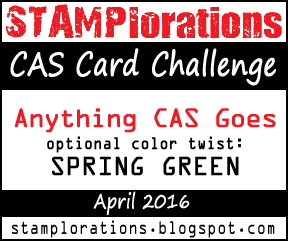 This month at Stamplorations CAS we have the usual Anything Goes with a twist of . . . can you guess from my card? Spring green! I needed a baby card like yesterday so kept the card really simple and, frankly, quick. I die cut the mobile danglies from watercolor paper I had colored using Brushos and Color Burst. I even dusted off the cat hair from my sewing machine and stitched the strings. So cute! 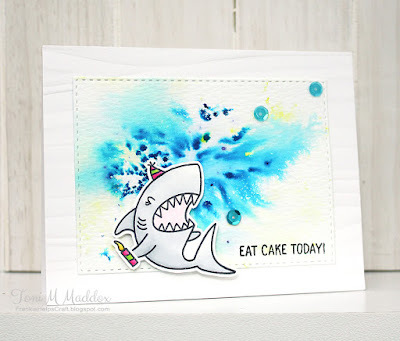 I used my new Hero Arts ombre ink for the sentiment. 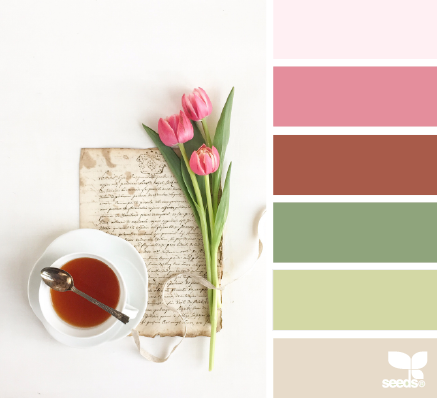 It's spring and time for all things green so come share your fabulous creations with us! 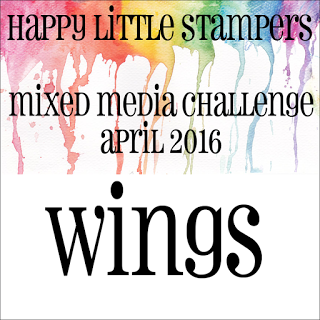 This month at the Happy Little Stampers Mixed Media challenge, the inspiration word is Wings. What do you think of with that word? I think of feathers, birds, super heroes, insects, angels, planes, da Vinci. Maybe you think of something totally different. Come on over and share your ideas with us! For my card I sprinkled some Jacquard acid dyes on mixed media paper and gave it a few good spritzes of water. I then used a paper towel to pull up some of the color, leaving a really cool texture (the upper left is a clear example). Next I stamped a sheet music background with white pigment ink. Having fun now! The two birds were next as well as a Copic branch and the sentiment. Not quite done but almost. I decided to add a bit of black embossing powder heated from beneath so I didn't need to use Versamark. Love the added tactile element. So that's what I did. What are you going to do? Can't wait to see! Guest Designing at the Color Throwdown! 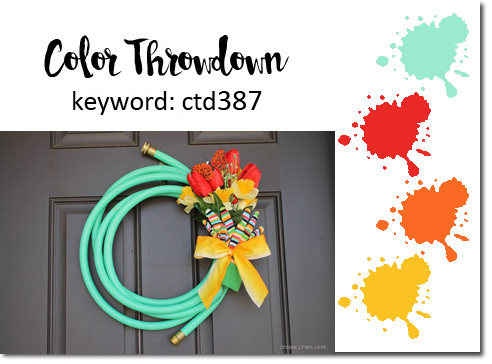 Today I am guest designing for the Color Throwdown. Woo hoo! I was so excited when I saw the inspiration pic this round. I could totally do that on my front door . 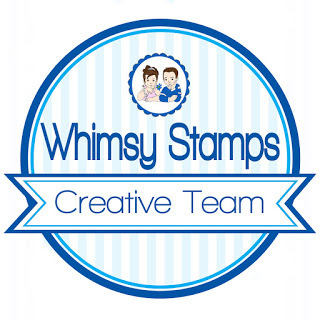 . . but I won't get around to it so I'll make a card instead! I love, love, love the citrusy plaid of my card with the aqua blue accents (thanks to The Heart Desires for enabling me and my plaid obsession). Talk about pop, pop, pop! 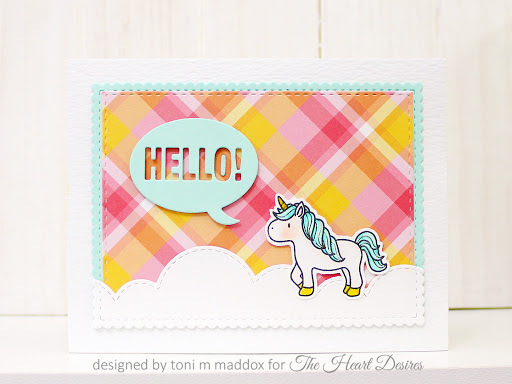 Plus, I got to use a fluffy cloud die with a unicorn. A unicorn! And do you see the texture on the white background? That's Tim Holtz watercolor paper leftovers. I love that texture but usually use the plain side for watercoloring so what a treat to use it on the flip. 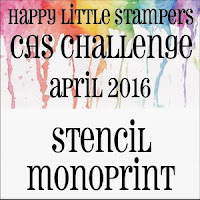 HLS CAS April Challenge Starts Today! 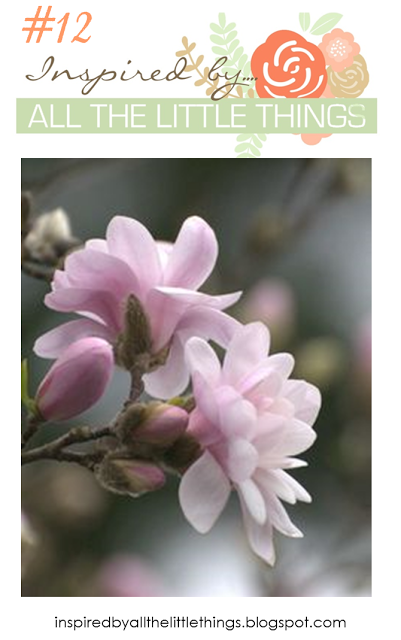 I'm in a spring mood but also mindful that Christmas arrives before you know it so I combined the two. What?! What?! 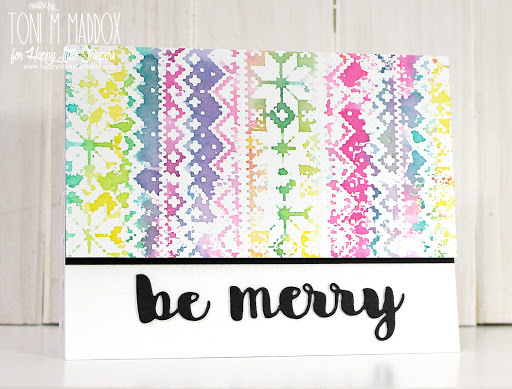 I used bright and happy Distress Inks and randomly ran them horizontally over my stencil, following the lines of the faux stitching. I overlapped in some places but not too much to avoid muddy colors and icking up my pads. I followed that up with a few liberal spritzes of water. 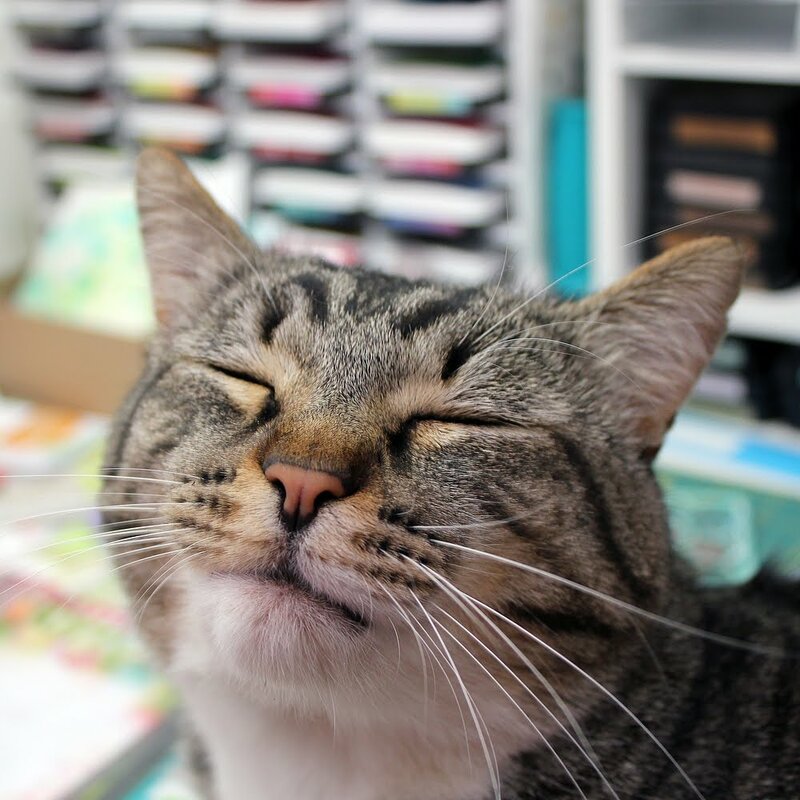 I have a roll of Bounty always at the ready in my craft space (yes, I have a cat) so I used that to absorb any excess ink that oozed out when I pressed the stencil onto my paper. Bright and fun and imperfectly perfect! 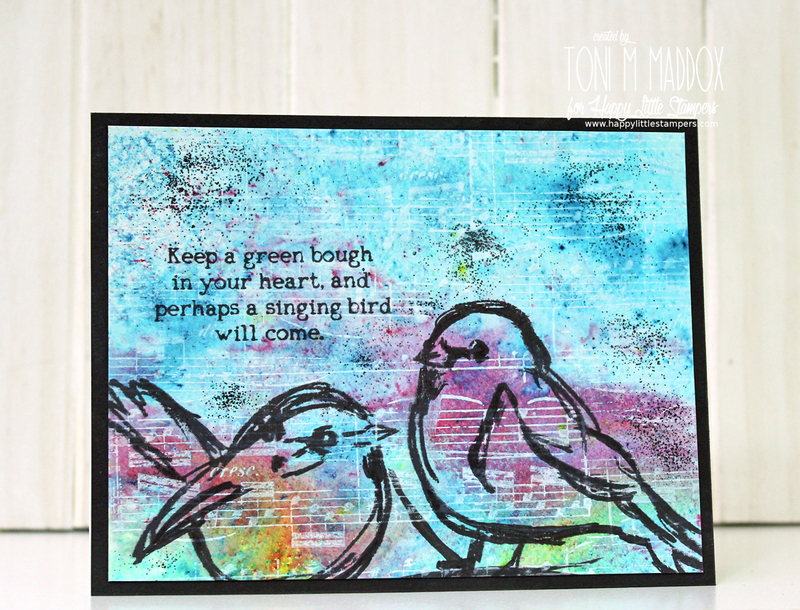 I used a textured cardstock behind the sentiment because it reminded me of ribbing. Easier to see irl. I hope you have a ton of ideas with this technique to share with us at HLS--looking forward to seeing what you link up! We have a fabulous new challenge for you at House of Cards this month! You can be inspired by the colors or include script on your card or be like me and use both! I wanted to try Distress Ink lifting that I had seen in a Jennifer McGuire video. Jennifer used a bright blue but I went the other direction and used Antique Linen. I rubbed the panel liberally then dried it. 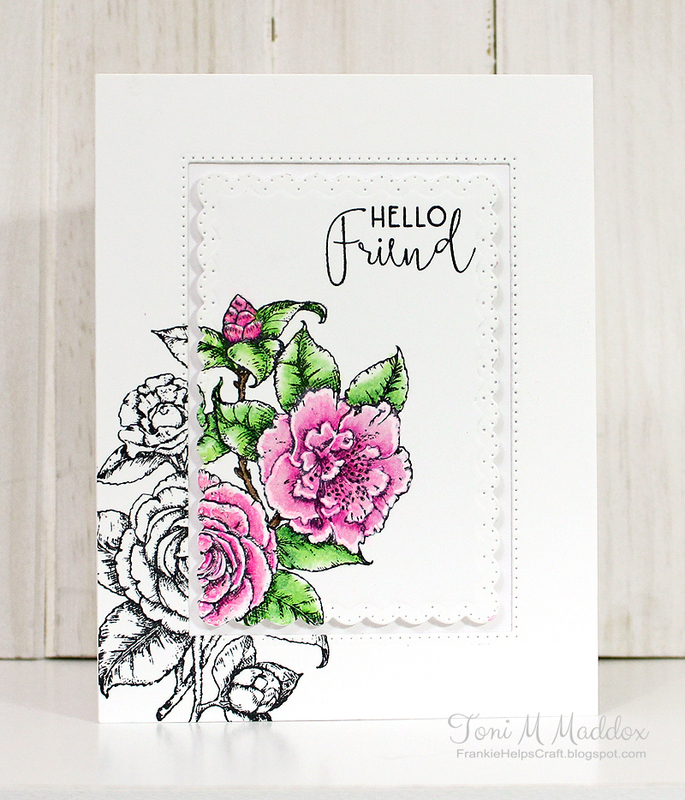 I then stamped my Penny Black background using Versamark and embossed it in clear. I didn't worry that the embossing wasn't perfectly smooth since I wanted a vintage look anyway. Next, I spread water over the non-embossed sections. The ink quickly moved out of the way. I colored the foliage using more Distress Inks. A very soft look. I set that aside to dry. While I was waiting, I colored a piece of cardstock with Worn Lipstick and die cut the stem from it. Wow, it was rave bright so I spread water all over it. I had to handle it very carefully because it wanted to fall apart in my hands. After I dried it with my heat gun, it was fine. For the leafy diecut, I colored the cardstock with Peeled Painted, applied water, and dried it before diecutting it. Much easier to work with that way. I wet embossed the vellum panel with gold. Dreamy. Finally I colored seam binding with the Antique Linen (direct pad to ribbon). That dried in like 5 seconds with the heat gun. Next I ironed off the embossing from the main panel which also dried it fully. It has a light suede texture now, just like the linen wallpaper look I was going for--tee hee! After that assembly was a snap, especially with the Bow Easy to make my pretty bow. I'm looking forward to seeing how you interpret the challenge. Come join us!